I swear every time I go to Jackpotjoy I find something new. They had a slot game that I had never played called Reel Wild West. I guess I get caught up in playing the slot game that I know and love that I forget to really look at all that they have to offer. Each time I do I come across a great find. 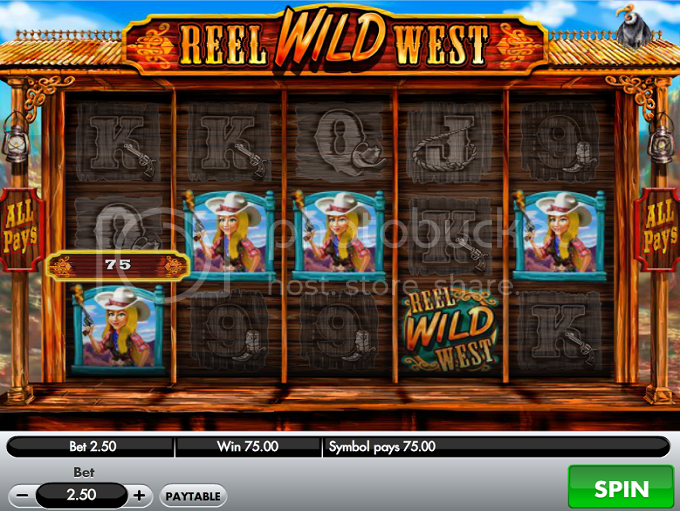 Reel Wild West is an old west themed slot game with 3 options when it comes to free spins. Three or more scatters launch free games and the player must choose either 15 with a 3x multiplier, 10 with a 5x multiplier or 5 with a 10x multiplier. When I'm presented with these options I usually aim for the one in the middle. I started betting at £1 per spin. I hit 5 'Q' symbols for £6. Other than that almost every spin resulted in zero. I was getting a little worried but I kept going. Something told me to raise my bet. When you have a feeling you must go with it. I raised my bet and the payouts began to pick up. Then, I hit 4 cowgirls and a wild for £75. No way I was giving all that back so I decided to play just £20 more and hit the road. Besides, I had to try and get the free spins. Not long after I got 5 cowboys for £25. Again I had a feeling. The feeling was to take my money and run. I was up around £50 when it was all said and done. I noticed a vulture sitting on top of the reels. This time there was nothing left for him to feast on.